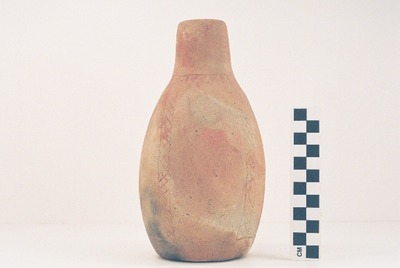 "41CE12-193, Burial AH-18" by Timothy K. Perttula and Robert Z. Selden Jr.
DECORATION (INCLUDING MOTIF AND ELEMENTS WHEN APPARENT): There is a single horizontal engraved line at the top of the vessel body, and another horizontal line near the base. The topmost engraved line has a series of large downward-pointing excised triangles. There are four narrow vertical zones or bands between the two horizontal engraved lines, and they are filled with cross-hatched engraved lines.